Finally, a simple static desktop web server. Because simple stuff shouldn't need Apache, IIS, or NGINX. Click to fire up/kill static web servers. Auto-detects available ports. 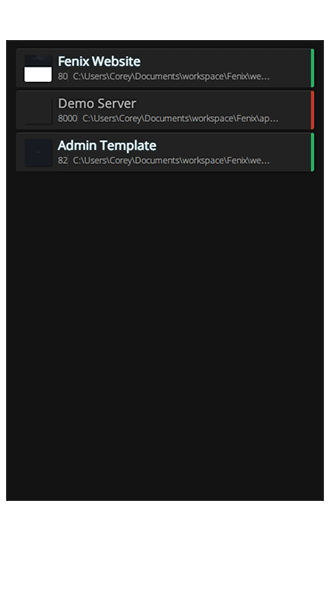 Includes a request bin, Growl support, Markdown rendering, and a slick command line tool. Visually manage local sites side by side, with thumbnails, logs, and more. Develop locally, share online through localtunnel — with a simple mouse click. Develop locally. Demo publicly. Done effortlessly. Fenix is for developers and designers working with static sites. Skip the infrastructure headaches. It's beautifully simple. Work on multiple sites simultaneously. Serve any number of HTTP projects side by side with Fenix. Fenix serves and receives. View JSON, XML, and other webhook payloads with the request browser. 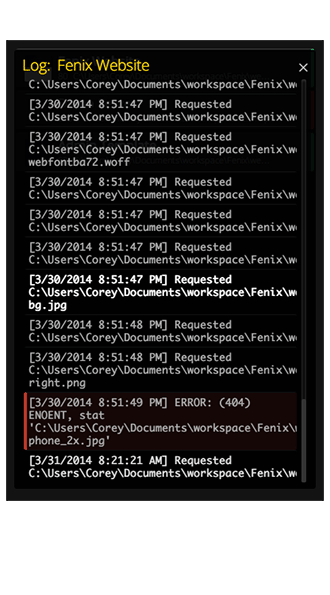 Create, stop, start, and share Fenix servers from the command line with the free Node.js console app. Create interactive web interfaces with .json or .xml files. No more Apache/IIS/NGINX needed for CORS! Turn your desktop into a public web server by sharing a link. Let collaborators/reviewers "touch and feel" the site. Control access to your work by turning on/off sharing at any time. Public sharing is tunneled through SSH (i.e. HTTPS). Simple works. We made simple web servers. See for Yourself. Track sites by meaningful names. Let Fenix find an available port for each server or specify your own. Server status at a glance. Receive a public URL to share with collaborators. 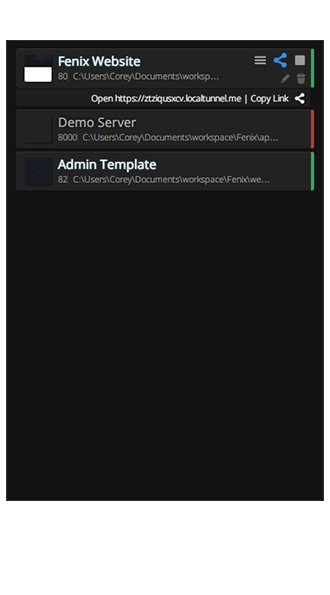 Easily scan logs with subtle and effective highlighting. Errors and warnings are color coded. Did we mention Fenix is open source? 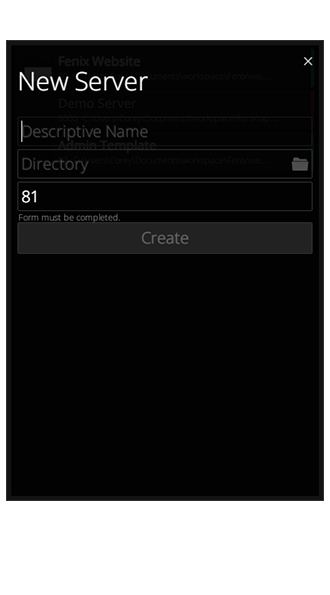 Manage evereything through a simple GUI. Two-way Communication. Examine real webhook payloads. See How. View requests as they arrive. JSON & XML request bodies are color coded with line numbers. Inspect HTTP headers as they're proxied to the request browser. Examine the actual data your apps use. Control servers from the command line too! Watch Now. Always buried in the console? No problem. Copyright © 2014 Corey Butler. All rights reserved.